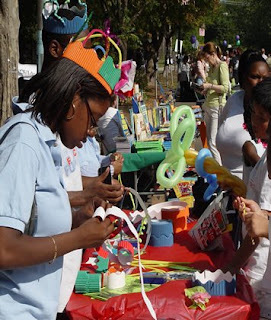 If you have kids, and anyone with a child in the Ray School Chess Club does, you may want to bring them to the annual 57th Street Children's Book Fair this coming Sunday afternoon. I think I've been to every one of these fairs for the past dozen years, and they're always a lot of fun. And if you have any connection to Ray School you won't have any trouble finding the event, since it's right there at the school. Chess, alas, won't be part of the official program, though if I can find a way to wrangle some space on the side informally I may set up a few boards. Absent that there'll be plenty of music, dancing, story telling, costumed characters--and books. You're kids like books, don't they? See the Web site for details. I'll see you there. For the second week in a row IM Emory Tate posted the only game victory for the Chicago Blaze, but this time, thanks to draws on the other three boards, it was enough to secure the margin of victory, as the team won its match last night against the Baltimore Kingfishers 2.5-1.5. On a night when Skokie Mayor George Van Dusen and Trustee Randy Roberts attended the games to show the town’s support for the Blaze, which plays at Skokie’s Holiday Inn, the four masters in the night's lineup took advantage of the political encouragement to finish the night without a loss. 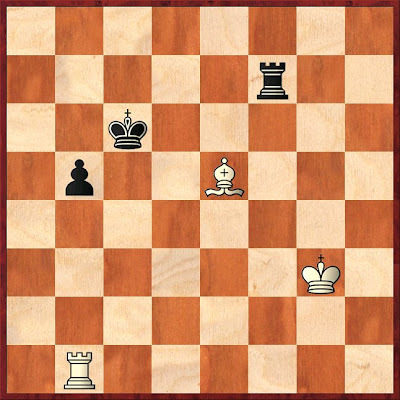 One of the most exciting moments of the evening came at the very end, when all the other games were finished and IM Mehmed Pasalic of the Blaze, down a piece, executed an exciting and skillful endgame against FM Ray Kaufman to secure a draw in the game and seal the match victory for the Blaze. There was a lot on the line. A loss for Mehmed would have meant a drawn match, depriving the Blaze of the victory that now puts them in a four-way tie for third place in the U.S. Chess League’s Western Division and keeps our playoff hopes alive. More later. For now, here’s what Mehmed’s endgame looked like. Once again, thanks to Betsy Dynako for serving as tournament director for the match. Idaho? Yes, Idaho. While chess is taught in many schools across the country, the Gem State is trying to get every school kid in the state playing the game. AP has the story. Well, you can’t win ‘em all. Last night, the Chicago Blaze went up against one of the strongest lineups a USCL team has brought to the boards this year and came up short, losing to the Seattle Sluggers 2.5-1.5. The Sluggers, who had struggled in the early weeks of the season, put a lot on the line, with a lineup that included two grandmasters, including super-GM Hikaru Nakamura, the former U.S. chess champion. In one of the most anticipated games of the season, Nakamura, with the White pieces, outlasted Chicago’s GM Nikola Mitkov in the 70-move marathon. The bright spot of the evening was IM Emory Tate, playing in his second match for the Blaze, who hung on to beat a tenacious NM Michael Lee. Emory thought he had a better position early in the game and said he was impressed with how long the youngster hung in there. I only have eyes for chess. 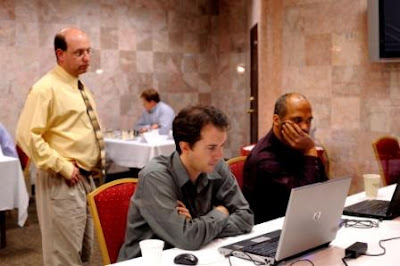 Eminent local chess personages Brad "Chessdad64" Rosen (left) and Larry Cohen cut up a bit during the match. The Blaze have fun even when they lose. Come and see sometime. On Board 4, Adam Strunk of the Blaze lost two pawns to Seattle’s Andy May and wasn’t able to recover. Click here for Seattle’s take on the match. Thanks to NM Len Weber for flawless tournament direction last night. Next up: the Blaze play the Baltimore Kingfishers a week from Wednesday. 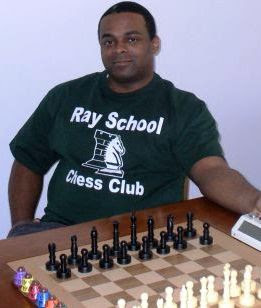 I’m delighted to announce that veteran Chicago scholastic chess coach Lamarr Wilson has joined the Ray School Chess Club and will be the club’s main chess teacher for the 2008-09 school year. Lamarr is no stranger to Ray, having been a friend of the club for years. He used to be the coach at Joplin Elementary School and has been active in Chicago chess circles for a long time as a teacher and webmaster. Today he is the president of SchoolTech Consulting, Inc., where he advises and assists Chicago public schools on their technology needs. We’re thrilled that Lamarr has agreed to take over the teaching duties at Ray, following the departure of founding coach Emil Sidky. Also, veteran Ray School chess mom Julie Vassilatos will manage the chess club meetings this year. Julie has been active in the club for the past three years and was one of the people most responsible for the success of the citywide chess tournament held at Ray in 2007. One of the things she plans is to have a special girls section of the chess club as part of an effort to attract more female players. Stay tuned for details. Julie and Lamarr will, I trust, be ably assisted by other chess parents. When Ron Burnett’s flag fell at about 11:00 last night, the din that went up in Patios A/B at the Holiday Inn Skokie was deafening. Despite the hurt it put on my ears, however, I was neither surprised nor irritated by the applause—from players, fans, managers, even the players’ parents—because it signaled that GM Nikola Mitkov, playing in his first game for the Chicago Blaze, had beaten IM Burnett of the Tennessee Tempo on the first board of this week’s U.S. Chess League match. Of course, it meant much more than that. As the last game of the night to end, it meant not only that the Blaze had won the first match in the team’s brief history, but that they had done it in stunning fashion, sweeping all games against the Tempo to finish 4-0 on the night. It was the first sweep in the league this season. Which game to choose as Blaze Game of the Week? Tough call. What do you think? It was an exciting night, and it means that the Blaze have arrived and demonstrated that they belong in the USCL. We’ll try to have details and analysis in the next couple of days, but there’s not much time to celebrate: the Blaze have a short week and face the Seattle Sluggers on Monday night. Once again: thanks to Betsy Dynako for first-rate tournament direction. If I wasn't the first person to suggest Michael Palin as a better alternative to now-ubiquitous one from Alaska, I was certainly one of the first. I'm glad to see someone else has picked up the meme. "Houston, you have a problem: checkmate!" How do you play chess in a low-gravity environment, where the pieces could simply float away? 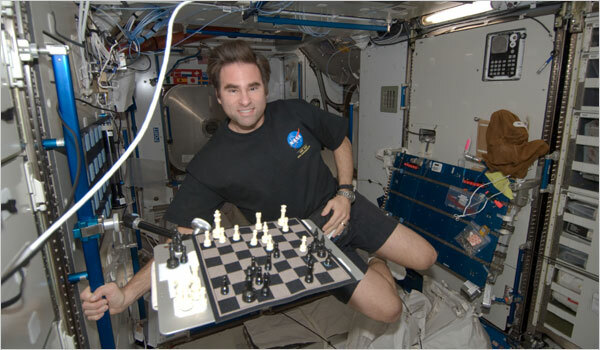 Parents who've taken their kids on long car trips face a similar challenge, but apparently the obvious solution, a magnet chess set, wasn't possible for NASA astronaut Greg Chamitoff, so he used Velcro. Apparently finding no suitable opponents among his crew mates, he played correspondence chess with colleagues in the control center on the ground. More from Dylan Loeb McClain in the New York Times. Blaze chief technology officer Sevan Muradian served as the official team glad-hander last night, congratulating the winning players: Mehmed Pasalic (top) and Angelo Young. After beating the Dallas Destiny last week, the San Francisco Mechanics may have thought they’d make short work of the Chicago Blaze. But the Bay Area powerhouse, which some say is the strongest team in the U.S. Chess League after their defeat of the defending champions from Texas, were thwarted in their march to glory as the new team from the Windy City posted two victories last night to come away with a draw for the match. Though the Mechanics’ blog spoke of compounding the Blaze’s misery after our opening-week loss to the Arizona Scorpions, the Blaze gave as good as they got from the Holiday Inn Skokie, as FM (IM-elect) Mehmed Pasalic beat FM Sam Shankland and FM Daniel Naroditsky fell to IM Angelo Young of the Blaze. Mehmed, who is undefeated in the first two weeks of play, posted the first victory of the night. 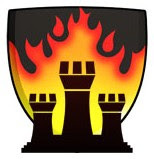 At that point it looked like it could be a big evening for the Blaze, but then FM Florin Felecan lost a hard-fought game to GM-elect Josh Friedel, and IM Emory Tate’s characteristically wild and wooly game with IM Vinay Bhat dropped into the San Francisco W column. It fell to Angelo to pull it out for the Blaze, and he did so masterfully, going up on time against Daniel Naroditsky and squeezing the California FIDE Master’s position. Naroditsky resigned at about 10:45 PM Chicago time. Don’t get me wrong: the Blaze would have been thrilled with a victory for the night, but considering this was only our second match and we were again facing an opponent with an overall ratings advantage, most of the team was satisfied with the result. We hope to have more later on—maybe some analysis later in the week. Please look at the games, leave your comments, and stay tuned. The Blaze are starting to set the league on fire. P.S. Many thanks to Maret Thorpe for first-rate tournament direction last night. I was up three pieces by move 12 of this G/5 game, and I had Black's queen by move 21. Why did it take me to move 34 to mate my opponent? By the way, don't forget to follow the Chicago Blaze tonight and root for them against San Francisco.